I have been looking forwards to this episode since I saw the title even after the announcement of ‘comedian’ Frank Skinner (Perkins) being given a part in it. I have never found the man funny but sometimes actors make brilliant serious actors and can bring a depth to a character. 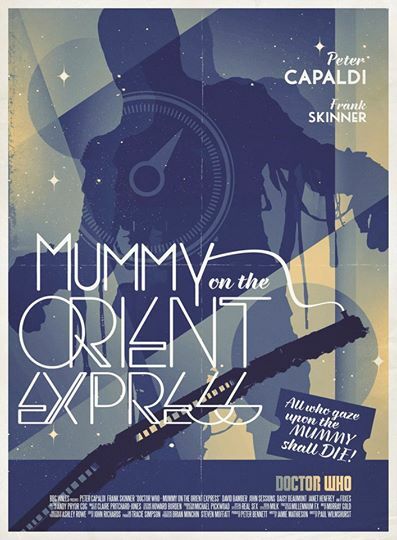 This episode, written by Jamie Mathieson and directed by Paul Wilmshurst starts out with an old woman who is travelling on a version of the Orient Express in space when she sees a Mummy coming towards her that no one else can see. It kills her there and then. The Tardis turns up soon afterwards with the Doctor and Clara on board ready to repair their friendship and to say goodbye but then they find out about the Mummy. Clara meets the Granddaughter of the victim, Maisie, who wants to see her Grandmother’s body and tags along with her. The Doctor meets the chief engineer; Perkins, who is mysterious and strange but seems to want to help him as a second killing occurs in the meantime. Meanwhile the Doctor asks a fellow passenger, Professor Moorhouse about a legend of the Foretold, a Mummy of ancient times and how it can kill in 66 seconds upon seeing it. Every time the light flashes they get 66 seconds until death comes to each victim. It seemingly kills those who are ill in some way or have been, mentally or physically and has been doing so for five thousand years. 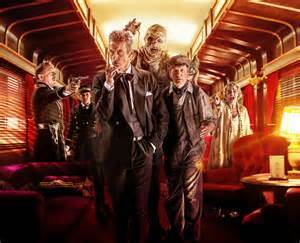 Clara and Maisie are stuck in a storage carriage with a sarcophagus of some kind whilst the Doctor is investigating. He the finds she is trapped and races to her rescue and then the sarcophagus opens and the Doctor is arrested on suspicion of the killings as a third occurs. The Doctor is then released as it occurs to him something is not right about the train and realises they are there on purpose and it is a trap and the computer Gus is the cause of it. Or is he? As a fourth victim is approached the Doctor tries to find out what the Foretold is and what has brought them together as they are up against mad Gus the computer that controls the train and a mythical creature they know almost nothing about. The Doctor thinks Maisie is next and asks Clara to lie to her as the Mummy approaches, the Doctor swaps places with her. Gus the machine that trapped them all then tries to kill them after the Doctor solves the mystery, except the one who was behind it all. Clara’s faith is then restored in the Doctor but not wholly but he is honest with her as much as he can be in his new incarnation. Perkins, the chief engineer is offered to go along with the Doctor on the Tardis in place of Clara but turns him down. She tells Danny on the phone that she loves him but loud enough for the Doctor to hear, seemingly meaning him and not Danny at all? She decides not to leave him then much to the Doctor’s relief. This episode was the best yet and is amongst the best in recent history. It was a mash-up of Agatha Christie and old Hammer films. It had everything Doctor Who should have and even gave me the shivers. The Mummy was scary to the point of adults only but I asked my six year old nephew what he thought about it and he said the Mummy was his favourite bit and he loved it all, saying it was scary with a big smile on his face and doing Mummy impressions and telling me what he looked like. He is a huge fan. As I have said before, Doctor Who is meant to scare kids and adults alike without being gory or overly violent. It shows how quality the writing and direction is now and what direction it is finally taking, namely going back to the way it used to be when I was a kid. Next weeks episode looks just as scary and the creatures look set to be the new Weeping Angels. I sincerely hope that they keep this up. It has been a fantastic series so far and the best yet. One last thing about the posters on each of these reviews I am doing each week on the right by Stuart Manning. Please visit his twitter or Facebook page and see his work as well as his Flikr site. They are all his own work and not affiliated with the BBC. It will only be a matter of time before he is signed up though for they have been amazing. This one is my favourite so far.